Join us for this fun 10k. All runners, and turkeys, welcome. We have awards for many age groups and frozen turkeys will be presented to some of the fastest runners. If you are able to volunteer please see the link below. We share the facility with a church so please be mindful of parishioners and use spaces farther away. Parking also available as you drive in at Arundel Middle School. Race begins in front of Arundel High School, continues along paved roads through two neighborhoods and onto the WB & A paved trail. The course is an out and back with the finish line at Arundel Middle School (adjacent to the High School). Plenty of course monitors will be out to direct you. COURSE WILL BE OPEN TO VEHICULAR TRAFFIC. Please be aware of your surroundings at all times. Two aid stations with water and Gatorade will be out on course. Runners will pass by both aid stations twice allowing runners four opportunities for aid. This year the premium will be a long sleeve sweatshirt. You MUST register by Tuesday November 7th to be guaranteed a premium. Participants who registered by Nov. 7 will receive the premium. Race day only 6:45am – 7:30am, Packet Pickup will be at the Arundel Middle School gym or gym lobby. Awards ceremony and refreshments follow the race in the Arundel Middle School Gym Foyer. along with Turkey trophies and medals for second and third place! Awards will be announced at 9:15 or when results are tabulated. Volunteers Needed and Appreciated! Please sign up to volunteer by clicking here. Contact the race directors (coldturkey10k@annpolisstriders.org) for more information or questions. 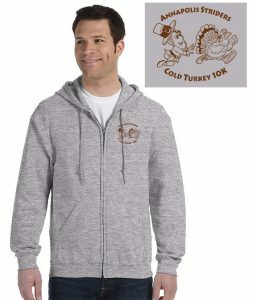 Email ColdTurkey10K@annapolisstriders.org to contact the race directors. This entry was posted in 10k, Registration on September 24, 2018 by Cold Turkey 10K Director.